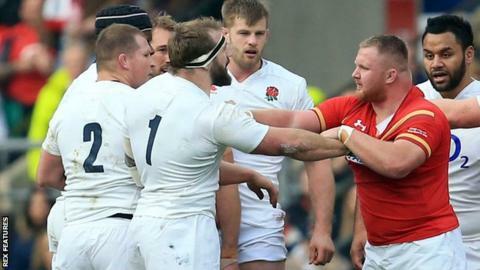 England's Joe Marler (centre) is confronted by Samson Lee, who later said he accepted the comment was "banter"
England's Joe Marler says he is not a racist, despite calling Wales prop Samson Lee "Gypsy boy". Prop Marler, 25, faces a World Rugby disciplinary hearing on Tuesday for making the comment during England's Six Nations win over Wales in March. On the eve of the hearing, he issued a statement saying he would accept any punishment given. "I'm not a racist. What I said to Samson was out of order and wrong and I am sorry it was said," he added. "Whatever happens to me I will accept. I'm sorry to anyone who was offended, saying it was 'in the heat of the moment' isn't an excuse but one comment, one mistake, does not make me a racist." Global governing body World Rugby said Marler's remark "amounts to misconduct and/or a breach" of its code of conduct despite Six Nations organisers already ruling he would not be punished for the comment. The Harlequins player apologised to Scarlets forward Lee, who is from the Traveller community, at half-time of England's 25-21 win. England coach Eddie Jones reprimanded Marler, while both Lee and Wales coach Warren Gatland dismissed the comment as banter, although Gatland later apologised for his remark. The Welsh Rugby Union issued a statement saying it was disappointed with the Six Nations decision not to punish Marler. Marler was free to play in England's final game, starting on the bench in a Grand Slam-clinching 31-21 victory over France in Paris.